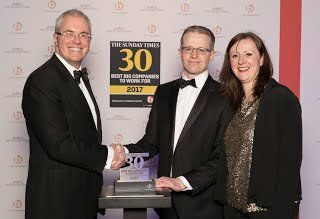 ODEON UK has, for the first time, achieved a placing in the Sunday Times 30 Best Big Companies to Work For 2017 list, at number 25. In addition, we are placed number 16 in Ireland’s Great Places to Work (Best Large Workplaces) and were awarded an excellence award for Most Inspiring Place to Work in Ireland. Securing a place in both of these prestigious lists on first entry attempt represents a huge achievement for our people and our brand.